Usually you find these watches all put together. 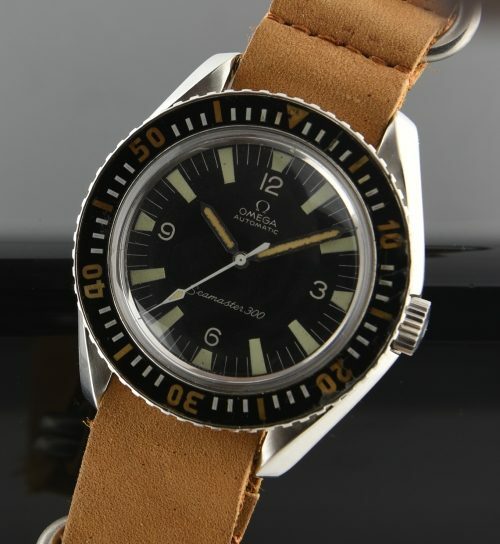 Well, this 1964 OMEGA SEAMASTER 300 is ALMOST completely original. The dial is original, but likely replaced at some time due to the lume colour not matching the hands. The hands are the first version ORIGINAL and match to the lume on the ORIGINAL bezel. The caliber 552 ORIGINAL movement dates to 1964 (matching the case-back) with a 21 million serial. The steel original case measures 40mm. The Naid non-screw-down OMEGA crown is the first version-original. The OMEGA hesalite crystal is present. The picture of the case-back is washed out, but all the writing is present and crystal clear. Finding original examples are extremely uncommon. You will love this highly desired OMEGA.